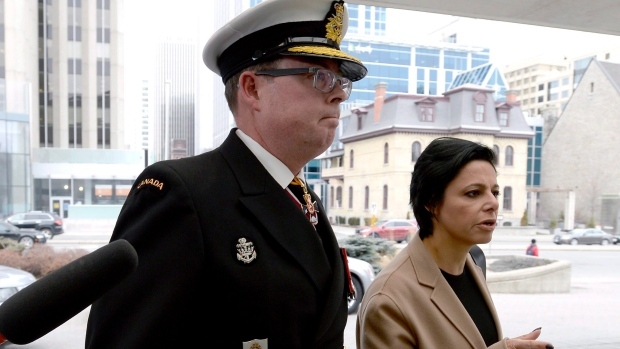 OTTAWA -- Lawyers for Vice-Admiral Mark Norman and the federal government argued Wednesday over the words of Canada's top bureaucrat during the SNC-Lavalin affair as the suspended military officer's team pressed for access to secret government emails and memos. At issue is whether Michael Wernick, the outgoing clerk of the Privy Council, waived solicitor-client privilege on some of those documents -- and thus opened the door to Norman's lawyers seeing them -- when he testified before a Commons' committee in February. During an appearance to address allegations of political interference in a criminal prosecution against SNC-Lavalin, Wernick at one point told the justice committee he decided to have the courts decide whether to release thousands of cabinet documents requested by Norman's lawyers. Previous to that decision in October 2018, it was believed the government would invoke a special legal provision and refuse any court requests for the documents, which Norman's team say they need to prove his innocence. "I made the decision, of my own volition, with my own authority, that the easiest way to deal with the Norman matter was to let the judge decide what was relevant," Wernick said on Feb. 21. Norman's lawyers argued Wednesday that the comment amounted to a waiver of solicitor-client privilege, meaning emails and memos related to that decision should be released even though the government says they contain legal advice and should be kept secret. His legal team believe those documents and others the government is trying to keep secret will prove Norman's case has been tainted by political interference and boost defence efforts to get the breach-of-trust charge tossed out. "It was the result of strategic, tactical, political considerations because the Liberals were made to look very bad in the House of Commons, in the media, day after day," Norman's lawyer Christine Mainville alleged of Wernick's decision to let the court decide the fate of those cabinet documents. Justice Department lawyer Robert MacKinnon pushed back, arguing Wernick did not waive any solicitor-client privilege and that Wernick's testimony was covered by parliamentary privilege -- meaning it can't be introduced as evidence in court. That privilege, which MacKinnon said extended to committee witnesses, was recently affirmed when a court rejected Sen. Mike Duffy's attempt to sue the Senate over his suspension from the upper chamber in 2013. Duffy is appealing the decision. MacKinnon added "there was nothing nefarious" about Wernick's decision to have the courts decide what documents should be released to Norman's team. He called the decision "helpful" to let "the defence proceed, in letting the court proceed." Justice Heather Perkins-McVey appeared to question Mainville's allegations, saying Wernick's decision "would put it all out there." MacKinnon defended the government claiming solicitor-client privilege to prevent the disclosure of dozens of others memos and emails about the case, including several memos from Wernick to Prime Minister Justin Trudeau. Those documents contain legal advice from government lawyers and solicitor-client privilege applies to the "continuum of communication," MacKinnon said, even though neither Wernick nor Trudeau are lawyers. Perkins-McVey will ultimately determine the scope of documents that Norman's lawyers will receive, including those considered cabinet secrets and others subject to solicitor-client privilege, in order to ensure a fair trial. Norman served as the military's second-in-command before being suspended and charged with breach of trust for allegedly leaking government secrets to influence cabinet's decision-making on a $700-million shipbuilding contract. He has denied any wrongdoing. His legal team has alleged the case against him is politically motivated and is trying to get access to the requested documents to officially make that case in an effort to get the charge tossed out before his formal trial starts in August.